I splurged and bought myself a little present: an ice cream maker! Mine is a Cuisinart Pure Indulgence Ice Cream Maker. I tried it out recently and am sharing the results and recipe with you today! I started with the basic: vanilla ice cream. This is my first ice cream maker and I’ve only ever made no-churn ice cream recipes in the past. Though they are yummy, there is something special about making ice cream in this machine. It was pretty simple and I plan to make more….lots more! Of course, I’ll share the fruits of my labour with all of you. The recipe itself is only four ingredients. The whole milk and sugar and mixed together on low first and then vanilla extract and cream is stirred in. Then it’s time for the magic to happen. The mixture goes into the freezer bowl of your ice cream machine and it churns for about 25 minutes. You can even watch to see it take shape. I placed the ice cream in some freezer containers and let it continue to freeze in the freezer for a good six hours. I prefer my ice cream a little on the firmer side. If you like soft serve ice cream, don’t leave it in the freezer as long. It came out perfectly. John even said it was better than store bought ice cream. It’s so creamy, indulgent with a pure sweet flavour. I can’t wait to make more, but I need more freezer space and freezer containers! You might also like this Vanilla Bean Ice Cream. Creamy and indulgent with a pure sweet vanilla flavour. Beat milk and sugar on low speed with a mixer for 2 minutes. Stir in table cream and vanilla. Pour mixture into an ice cream maker. Turn the machine on and let mix for 25 minutes. Transfer ice cream to freezer proof air tight container. Freeze for at least 2 hours or longer. once you’ve tried homemade vanilla ice cream…..nothing else will do! I do not have an ice cream maker, but I need to get one. 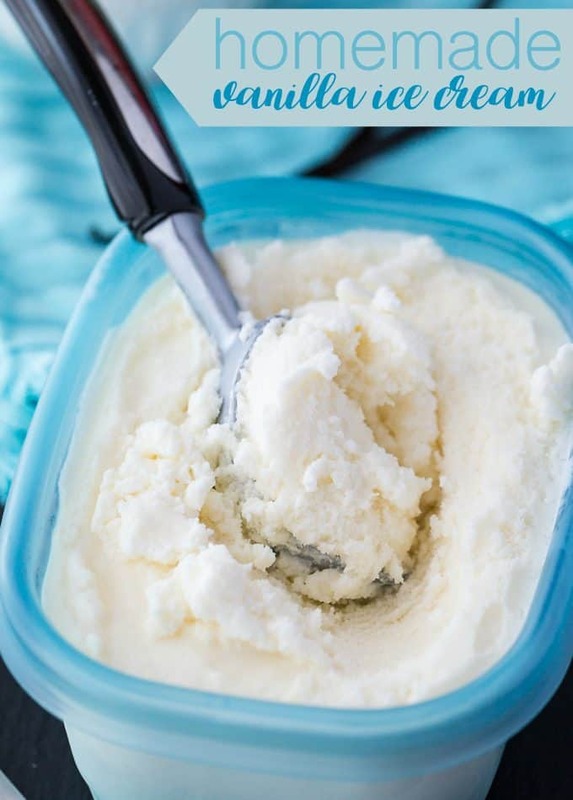 This recipe for Vanilla Ice cream looks so good and no preservatives in it! I want to make it! I love checking in on the latest tricks and tips. Thank you! I have an ice cream maker too and love it! 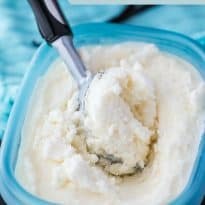 Homemade Ice Cream is so good! We have a mini ice cream maker but my daughter loves to make ice cream, so maybe we should buy a proper one. This recipe gives me the inspiration to do so! Thanks for sharing going to try this for the grandkids on the weekend,may even add some fruit. this looks so delicious! i used to love making homemade ice cream as a kid. I have an ice cream maker, but haven’t really started using it – though I’ve been wanting to start for a while now! This sounds like the perfect way to get going, simple, but oh so good! I’m such a fan of homemade ice cream! Definitely giving this a try!